Another day and another young Hen Harrier is listed as ‘missing in action’. This time it is Arthur, brother of Octavia; she was declared ‘missing’ in August. These two Hen Harriers were part of a brood of four chicks ringed and satellite tagged on 16 July by NERF members in the Dark Peak as part of the RSPB Hen Harrier LIFE Project. These four chicks carried the hopes and aspirations of the National Trust, the Peak District National Park, local Raptor Workers and all wildlife lovers living in the North of England in general and the Dark Peak in particular. Raptor persecution has been endemic in the Dark Peak for many years and has been documented by the RSPB in their publication ‘Peak Malpractice’ and the subsequent update. After several high profile incidents, occurring over many years, in 2018 matters appeared to be improving. When the Hen Harrier nest was discovered by NERF members, the hope was that the tide had turned, not just in the Dark Peak but across the Northern uplands as a whole. The organisations and individuals involved with these birds must be bitterly disappointed at this latest news. However NERF recognises their commitment and hopes for a better outcome in 2019. Fortunately we have a great deal of evidence that reveals just how vulnerable Hen Harriers juveniles are when they leave their natal area. Thanks to the satellite data we know that Arthur spent his early days close to his nest before visiting the Brecon Beacons. He returned north, first to the eastern farmland in east Nidderdale before moving on towards the north-east. The satellite stopped transmitting, inexplicably, at Lowna Bridge in the North York Moors on 26 October. The area was searched thoroughly by RSPB Investigations staff, using very sophisticated equipment, yet once again the body was not located. The last known fix [LKF] is close to grouse moors and ironically about 300 metres north-west of Grouse Hall. Whether or not this is significant may be answered by the Police enquiries, although NERF will not be holding its collective breath that the Police will be in a position to make any meaningful progress with this case. Five Hen Harriers from the 2018 cohort that were located, monitored, ringed and satellite tagged by NERF members have joined the ‘disappeared’. Hilma, Thor, Athena Octavia and Arthur – all missing – along with three others Heulwen, Stelmaria and Margot, which were not monitored by NERF. The phrase, ‘tip of the iceberg’ is often used when conservationists discuss raptor persecution and it is very likely to be an accurate description of the true extent of the problem. It is inconceivable that the only birds to have ‘disappeared’ from this year’s Hen Harrier broods are the ones that we have recorded from the satellite data. The question is ‘how many more are missing, presumed dead’? Of course the ‘tip of the iceberg’ analogy is based on a mixture of facts and anecdotes together with the analysis of raptor ‘black holes’ in habitats that are eminently suitable for particular species. Goshawks and Red Kites, which are absent from large swathes of the NERF Study Area, immediately spring to mind. Whilst this type of speculation / calculation may not be based on pure mathematics the totality of the information available from all sources pushes the speculation to the very brink of reality. It is clear that the two scenarios provide significantly different outcomes. The consistent failure to find birds that suffer from a catastrophic satellite tag failure is a good indicator that something unnatural is occurring in these cases. This consistency is ‘evidence of similar fact’ and should be treated as such by Defra and Natural England ministers and mandarins. Regrettably we all know that in this case, as with all of the others over the years, the North York Moors will echo to the sound of silence from Michael Gove and Therese Coffey. What will it take Secretary of State Gove before you do or say anything other than trotting out the usual pre-prepared statement that you have a Hen Harrier Action Plan? If you have a plan Mr Gove you can be reassured by Raptor Workers and others that your plan is not working. You need to formulate an effective Plan before more Hen Harriers join the ranks of the ‘disappeared’ and the species reverts to being at serious risk as a breeding species in England once more. It is not possible to predict when NERF will be obliged to write another obituary for a Hen Harrier but it is likely to be in the not too distant future. Raptor Workers and conservationists have to remain positive despite the adversity they face almost daily. It is worth taking inspiration from the following advice. ‘It does not matter how slowly you go as long as you do not stop’. We may be going slowly but we will not stop highlighting the issues affecting Hen Harriers and all other raptors. This entry was posted in NERF Statement on 13/11/2018 by raptorforum. In the week when the country is commemorating the 100th anniversary of Armistice Day another 4 young Hen Harriers, one of which fledged in England, are listed as missing in action……. Athena, is the Greek Goddess of wisdom, courage, inspiration, civilization, law and justice. The nest from which Athena fledged was located in Northumberland and was monitored throughout the season by, NERF members, RSPB Investigations Team members and a Natural England fieldworker. We are grateful to all of the people involved for the dedication that they exhibited over many months. The nest was in a very remote location and to get to a suitable location from which to monitor the nest meant crossing difficult terrain. This was undertaken day after day for several weeks and as we all know this activity is not without risk. When the fieldworkers are two hours from their vehicle and then a further hour from the next human being a simply trip and twisted ankle can be a serious event. We have mentioned before, and no doubt will do so again, that Hen Harrier Raptor Workers undergo a roller coaster of emotions during the breeding season; the excitement of finding a nest, the concern experienced whilst watching for hours before a food pass and delight when the first flight occurs. Athena was ringed by a NERF member and another member of NERF fitted the satellite tag. The physical and emotional investment paid off as Athena strengthened flight muscles and learnt to hunt. It is a magical experience to watch a fledgling develop, both visually on the ground and remotely by satellite. Unfortunately all ‘magic’ is transitory and illusional and our hopes and aspirations for this young female have come to nought. Once again the roller coaster came off the rails. The RSPB have reported that Athena travelled from her natal area to the north-west of Grantown on Spey, Inverness-shire; in a straight line that is around 250 km. Add to that all of the to-ing and fro-ing and this young Harrier had flown many, many hundreds of kilometres and she had demonstrated that she was a fit and capable hunter. On the 16th August her satellite tag suffered an unexpected catastrophic failure and the last known data fix revealed that she was on a grouse moor. Now consider the disparity between the two scenarios and ask why are the two datasets poles apart, why are the outcomes so different? This continuing repetitive, albeit circumstantial, evidence pushes the thought experiment to a conclusion beyond the coincidental. We await the response from the Scottish Government to these latest revelations. Recently they have appeared to be taking a more robust course of action than that which we have come to expect from the English Government. Hopefully we will see a similar response from the Scots to these latest tragedies. We all know that the English breeding Hen Harrier population remains perilously small and the loss of a potential breeding female from that population will have a disproportionate detrimental effect. It is difficult to believe that Secretary of State Gove, or any of his Ministers, will contact his Scottish counterpart to question what action they are taking to investigate the tragic loss of Athena. Why would he when he shows little interest in Hen Harriers that vanish in the English uplands? The list of Hen Harriers that are known to be dead or have ‘disappeared’ continues to grow and of course we only know about the satellite tagged birds. The proportion of birds that have been lost from the untagged cohort is not known but there can be little doubt that it will be significant. There will be people living in the local rural communities who are horrified by these losses on their doorstep, others living in the same location will know what is happening to these missing Hen Harriers but choose to remain silent. There are individuals who represent the shooting industry who also know what is happening to the missing Hen Harriers, some of them are in denial. Others within the area know full well what is happening; the naysayers who know and don’t give a damn. Which category are you in? Will you be part of the solution and help the Police to investigate these crimes? Or will you be part of the problem and remain silent? Those who hold what is unreal to be real, or what is real to be unreal, will never know the truth. The Buddha. This entry was posted in NERF Statement on 08/11/2018 by raptorforum. Another ‘disappeared’ Hen Harrier! 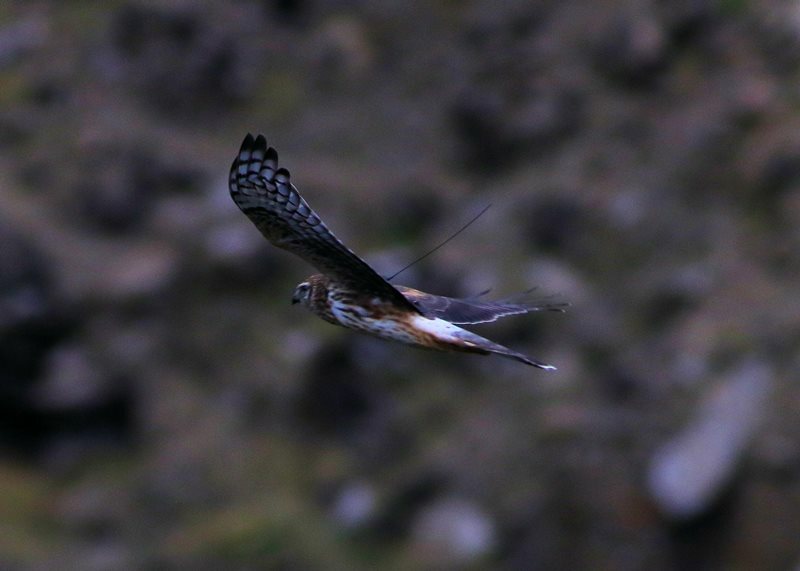 Another Hen Harrier ‘disappeared’ near grouse moor! Another catastrophic sat-tag failure! Mabel has joined the ranks of the ‘disappeared’. Another potential breeding female gone, gone but not forgotten. Anyone who has committed endless hours monitoring, protecting Hen Harriers will tell you that it is not just time commitment that is involved, it is the emotional investment that is required to see the process through from nest to fledging that takes its toll. But when that magic moment comes, and the chicks take flight it instantly becomes worthwhile. Everyone involved knows the risks that young birds face post fledging. Everyone knows that nature will take its course, that some won’t make it. It’s sad but inevitable. Survival of the fittest intervened and that’s fine. What’s not fine is that the ‘disappeared’ weren’t subject to some Darwinian theory. There are years of data all pointing to the same conclusion. Nudge theory is more relevant than Darwin. A little nudge in the right direction can have a massive impact. In almost every case ever recorded the same scenario plays out. The birds fledge and survive for several months, clearly, they can hunt and feed themselves. The sat-tags provide good data during that time then catastrophically fail without warning. Why? Sat-tags very rarely fail. Extensive searches using the best technology available fails to find a body. Why? All of this happens on or near grouse moors. Why? To the layman there appears to be a pattern. To professional ornithologists there appears to be a pattern. To NERF there appears to be a pattern. Even NE believes that there is a pattern and, they have published that belief. And yet the grouse shooting industry continue to peddle the same old story “you can’t prove it”. It may be true that the ‘who dun it’ may remain unknown, however the evidence, albeit circumstantial, of ‘what dun it’ is becoming increasingly difficult to defend and yet try to defend it they do. Don’t let anyone tell you that the loss of a Hen Harrier chick in these circumstances does not have the same effect as a bereavement because they are wrong. Our sympathies are with the landowner, the Dales NP staff and the NE staff on the ground who have all put so much effort into securing the future of Mabel and her siblings. All for nought. And how many others, not tagged, have died? That’s anyone’s guess but the answer is more than one. How long will it take, how many more ‘disappeared’ Hen Harriers will there have to be before DEFRA comes to the same conclusion and takes any affirmative action? Regrettably the answer is many more and that is shameful. This entry was posted in NERF Statement on 19/10/2018 by raptorforum. Today 18th October 2018, the RSPB announced that Thor, one of the young Hen Harriers tagged as a part of the RSPB’s EU-funded Hen Harrier LIFE project in June 2018, is no more. Thor fledged from a nest found and monitored throughout the breeding season by NERF members. One of three successful nests in the Forest of Bowland and the first successful breeding since 2015. This year three nests fledged a total of thirteen young. The satellite tags fitted to Hen Harriers are phenomenally robust and reliable and once again this tag showed no evidence that there was a problem before it catastrophically failed. We know from the tag data that after leaving the nest Thor stayed in the nest vicinity for several months. Almost too predictably this young bird recorded its last known fix within only a short distance of where Sky and Hope recorded their last known fixes, in 2014 within a few days of each other. Sky, Hope and now Thor along with five Natural England tagged Hen Harriers that we know have gone missing, we can only speculate at how many un-tagged birds must have suffered the same fate in this area. Once England’s last remaining stronghold for Hen Harriers, the Forest of Bowland (an area in the spotlight just a few weeks ago due to the court case surrounding the persecution of Peregrine Falcons at their nest site), is designated as a Specially Protected Area for Hen Harriers, designated to hold twelve breeding pairs. Whilst this would itself be a fraction of the breeding population recorded in the not so distant past, the Forest of Bowland SPA has only managed to produce 6 successful nests in the last 5 years. The English Hen Harrier population remains perilously small, with no more than 23 nesting attempts in any one year in the period 2002-2008. Productivity from successful nests is high, but very few nesting attempts are successful on grouse moors. There is compelling evidence that persecution continues, both during and following the breeding season. Persecution continues to limit Hen Harrier recovery in England. Readers should also remember that only a few months ago the representatives of the shooting industry were celebrating 9 successful nests from a total of 14 breeding attempts in the whole of England in 2018. No doubt we will be bombarded with the usual trite condemnations, or silence. Either way nothing will change, the criminals will continue killing Hen Harriers, the industry representatives will tell us that they are the solution to the problem when in fact they remain part of the problem, the Government will ignore the situation, again. So it goes on. The Raptor Persecution Priority Delivery Group has a new Chair and the response to this incident will be the first test of how the Group will move forward. This entry was posted in NERF Statement on 18/10/2018 by raptorforum. Bob Elliot, UK Head of the RSPB Investigations Team, is moving on to take up a new post as the Director of OneKind. Throughout his tenure as the Department Head Bob has worked tirelessly in the fight against the seemingly never-ending battle to protect the UK’s raptors from relentless persecution. It is widely acknowledged that the RSPB Investigations Team does phenomenal work aiding the police and prosecuting authorities to put the criminals who kill birds of prey before the courts. However, a good team needs good leadership and Bob provided that leadership expertly. NERF wishes him well as he follows his new and exciting career path, however from a purely selfish point of view there is no doubt that he will be sorely missed by Raptor Workers across the UK, and OneKind can count themselves fortunate to have lured him away. This entry was posted in NERF Statement on 06/10/2018 by raptorforum. These words were written by Joni Mitchell in the 1960’s to reflect a young man’s rite of passage but she could have been predicting the fate of Hen Harriers. Unfortunately despite decades of protective legislation Hen Harriers have no rights, they hatch, they fly, they disperse and then they ‘disappear’ on land used for driven grouse shooting. They hatch, fly, disperse and ‘disappear’ – the circle game is complete for another season. Another season in a long line of such seasons; round and round we go and nothing changes. NERF members found the nest in the Peak District from where Octavia would fledge and our members also found the nest in the Scottish Borders from where Hilma would eventually fledge. NERF members monitored the nests throughout the season, fitted rings to the chicks and later fitted the satellite tags. Endless voluntary hours, committed over many months, to ensure that the cohort of 2018 had the best possible start to their lives – a future flying free. We now know that the future for these three birds was predictably short and that they have ‘disappeared’ on, or adjacent to, grouse moors. 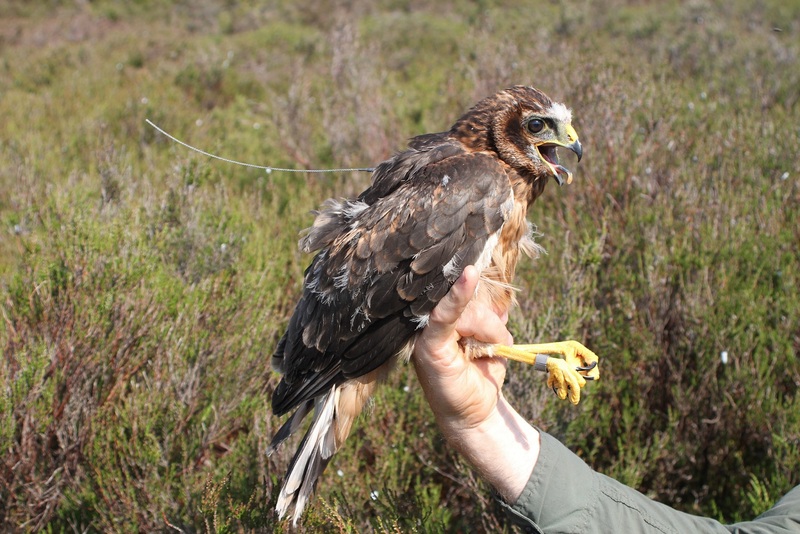 We know this because they were fitted with satellite tags as part of the RSPB’s EU Hen Harrier Life Project. Hilma ‘disappeared’ on a grouse moor in Northumberland and Octavia ‘disappeared’ on a grouse moor at Broomhead in the Peak District. The third ‘missing’ bird, Heulwen, hatched in Gwynedd, North Wales and its short life ended near Ruabon Mountain also in North Wales. The satellite tags fitted to Hen Harriers are phenomenally robust and reliable and they showed no evidence that there was a problem with any of them before they all catastrophically failed. But what about the chicks that were not tagged? It doesn’t take crystal ball gazing to envisage that these three young birds are the only ones to have suffered from the same fate already this year. Undoubtedly there will have been others, perhaps a higher number, so here we go again round and round again in a never ending circle of death and destruction; Hen Harriers sacrificed at the altar of Red Grouse shooting. There is no point in asking ‘how long can this go on; when will the killing stop?’ because it will not stop until Defra and Natural England deal with the raptor related criminality with the ferocity that it deserves. Regrettably that’s not on the agenda today or for that matter for the foreseeable future. 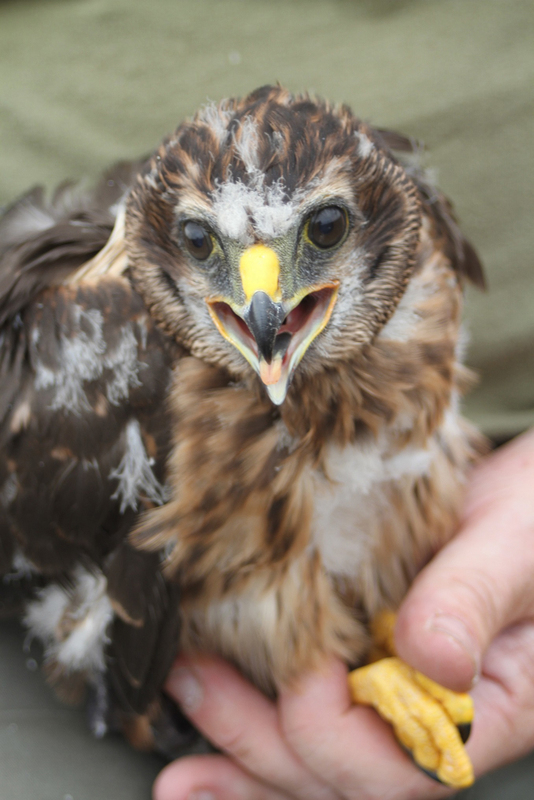 Hen Harrier reintroduction schemes and brood management schemes are not the answer. We know that, the shooting industry knows that and the Government knows that. The problem is that the Government is wedded to these ridiculous schemes. Lord Keynes said ‘when the facts change, I change my mind’. He didn’t say no one else should change theirs when the facts change and it is self-evident that the Government needs to change its mind and work towards a realistic solution to reinvigorate the remnant English Hen Harrier population by directly dealing with the problem at source. It is clear that many of the individuals involved in the shooting industry have no respect for the law and they will never give up their hatred of birds of prey. It is also self-evident that the organisations representing the industry have no control whatsoever over the criminal element that pervades the industry and yet Defra and NE continue to treat them as ‘partners’. They are not part of the solution, they are part of the problem, unable to deliver anything to prevent the massacre of our natural heritage despite their never ending proclamations to the contrary. Here we have evidence of another litany of missing Hen Harriers and undoubtedly more young Harriers will join the ‘disappeared’ in the near future. Once again NERF is calling on the Government to licence driven grouse shooting. Will the Government listen? Will the Secretary of State do the right thing and give the appropriate, overdue instructions to his Civil Servants to set the process in motion? We doubt it. More Hen Harriers will be killed. Will we ‘go round and round again in the circle game?’ No doubt we will. This entry was posted in NERF Statement on 14/09/2018 by raptorforum. Another ‘custodian of the countryside’, has been found guilty of killing birds of prey on a grouse moor. Perhaps it should read that it was another poor harvest in the ‘grouse moor orchard’ as another bad apple cropped up. On this occasion it was two Short-eared Owls that were quietly going about their business, looking for food, when they had the misfortune to cross the gun sights of Timothy Cowin, the gamekeeper on the Whernside Estate in the Yorkshire Dales National Park. Having said misfortune, perhaps it was only a matter of time before they were shot to death on this particular grouse moor. The Whernside Estate had been on the radar of the RSPB Investigations Team for a couple of years following a Police investigation in to a report that a pigeon had been found in a crow cage trap on the moor. This is a common practice on shooting estates, used to lure raptors into crow cage traps and is illegal. Unfortunately there was insufficient evidence to pursue this case. In April 2017 the RSPB returned to the estate to monitor the situation on the ground. At that time two of the Investigations Team bumped into Mr Cowin and exchanged pleasantries before continuing on their way. A little later they saw a masked man dressed in camouflaged clothing sitting a few metres from a plastic decoy and what appeared to be a speaker box on a fence post. A few days later the RSPB Team returned to install a covert camera but before they had the opportunity to do so Mr Cowin turned up, wandered over the moor and shot two Short-eared Owls to death before concealing their bodies. The incident was filmed and the Police were called. The response time of the Police was exceptionally quick and they arrested Mr Cowin at the scene. Mr Cowin eventually appeared before the court on 28th August 2018 and pleaded guilty to killing the two owls and to the possession of a device that is capable of being used to lure birds of prey within killing range. He was fined a total of £1,210, including costs and a victim’s surcharge. Many commentators have since derided this amount as far too lenient for this type offence and vented their anger on the courts when it would have been more appropriate to concentrate on the sentencing guidelines that sets out the punishment levels that are available to the magistrates. There we have it; another case of birds of prey being killed on a grouse moor in the North of England and we only know about it because of the hard work of the RSPB Investigations Team. It wasn’t luck that put them on the Whernside Estate on that day; it was hard, intelligence led graft and it paid off. Of course you don’t have to be a statistical genius to work out that the chances of catching 100% of the raptor persecutors in the act of killing birds of prey will be close to zero. That leaves the obvious question; how many more birds are killed in similar circumstances that go undetected? Information received by the RSPB Investigations Team suggests that the numbers are very high. Mr Cowin faced trial and was rightly convicted and since he pleaded guilty there is no right of appeal against his conviction and that is the end of it. But this cannot be right. Grouse moor owners are not, under the current legislation, culpable in any way what-so-ever for the actions of their staff. There are so many of these cases of raptor persecution on grouse moors that it is clear that the law requires updating immediately. Grouse moor owners and managers must be held accountable for the unlawful actions of their staff and it is high time that the offence of ‘vicarious liability’ is enacted. Vicarious liability is common place across many other industries and is already in place in Scotland for cases such as this. Once again English legislation is, lamentably, out of touch with reality. When these offences took place Whernside Estate was, and in fact still remains, a member of the Moorland Association [MA]. We are told constantly, ad nauseam, by the MA that grouse moor owners and managers are capable of self-regulation and legislative intervention is not necessary but this is self-evidently not the case and a system of licensing game shooting is long overdue. The Moorland Association condemned the actions of Mr Cowin but in reality they were faced with Hobson’s Choice; unable to do anything else but condemn raptor persecution in general and him in particular. The Moorland Association is a member of the Government’s Raptor Persecution Priority Delivery Group [RPPDG]; as are the RSPB, the Police and for that matter NERF. Why didn’t the Moorland Association’s press release contain a sentence along the lines of ‘Thanks to the hard work of the RSPB’s Investigations Team and North Yorkshire Police another raptor persecutor has been successfully prosecuted and we are grateful to them for ridding our industry of yet one more criminal, please continue your excellent work’. Could it be that they are more used to criticising the RSPB rather than supporting them and consequently felt unable to support them? Another interesting fact about this case is that the RSPB were on the Whernside Estate to install a covert camera in an attempt to film potentially criminal activity. Although they didn’t have the opportunity to do so before Mr Cowin committed the offences that was their intent. We also know that they did indeed film Mr Cowin, without the consent of the landowner. In this case the Moorland Association haven’t condemned the RSPB for covertly filming the defendant as they did following the recent court case involving the killing of two Peregrines in the Forest of Bowland, Lancashire. Does this signal a change of heart by the MA? Do they now support the RSPB installing covert cameras to catch criminals on grouse moors? Alternatively was the MA left unable to criticise the RSPB in this case because Mr Cowin pleaded guilty? We will find out the answer to that question when the next case involving evidence obtained by the RSPB, using covert filming, comes before the courts; and there will no doubt be many more than one, and probably sooner rather than later. NERF would like to thank the North Yorkshire Police, the CPS and the RSPB Investigations Team for their hard work in bringing this case to a successful conclusion. This entry was posted in NERF Statement on 31/08/2018 by raptorforum.